With more hours of sunshine, buds appearing on trees, and my first seed garden happily sprouting on the windowsill, I’m in full spring mode and planning for patio entertaining. Springtime encourages me to transition from the richness of whiskey cocktails to the lightness of gin cocktails, but I crafted this cocktail with a barrel-aged gin to make that transition smoother. As I’ve mentioned in earlier posts, barrel-aged gin is an excellent option for guests who are weary of the juniper and other herbal notes of traditional gins. Aged gins tend to carry the richer oaky mouthfeel of whiskey with a smoother layer of herbal flavor. KOVAL barrel-aged gin is one of my favorites, in part due to the flavor profile and in part due to the gorgeous bottle design (pro tip: keep the bottle once it’s empty and add a pour spout to use for storing olive oil on your kitchen counter). Choosing a more rounded gin allowed me to add different herbal notes with one of my favorite new liqueur additions to the home bar: Italicus. This liqueur is technically an Italian aperitivo but it’s not bitter as you would expect. On the contrary, this liqueur is citrus and floral forward and incredibly bright. It’s primarily built with bergamot and another Italian citrus variety with the addition of chamomile, lavender, gentian, rose and melissa balm. To continue along the path of juicy, fruit-forward flavors, I added muddled Champagne grapes to the mix. This grape variety is small, sweet, and crisp with just a hint of tartness. They’re wonderful muddled and double as a beautiful edible garnish for this cocktail. If you can’t find Champagne grapes in a store near you I’d recommend using ripe green grapes instead. I finished this drink off with a touch of lemon juice to balance the sweetness of the fruit and liqueur and a splash of club soda for bubbles. The resulting cocktail is bursting with citrus, ripe fruit, and herbal notes yet is incredibly smooth and refreshing. Muddle grapes in a shaker until all juice has been released, then add ice and all ingredients other than the club soda. Shake until chilled and strain into a stemmed glass. Top with club soda as desired and garnish with additional grapes. 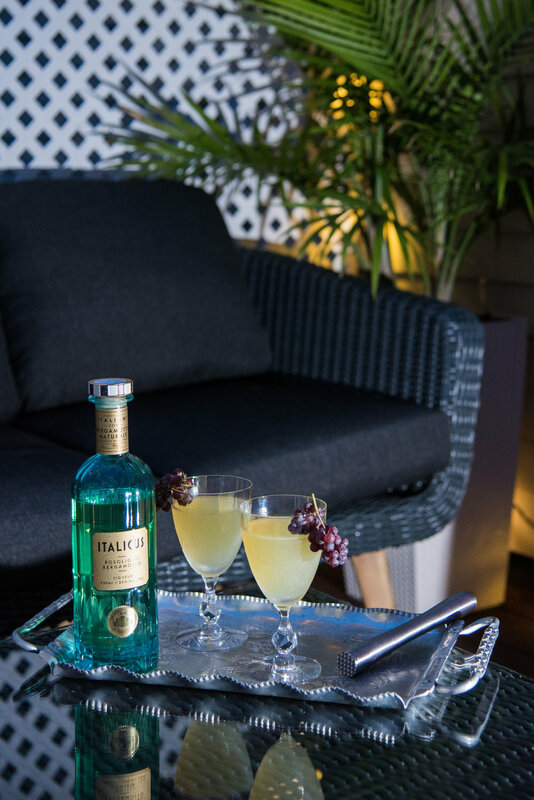 Enjoy on the patio in the warm, tranquil dusk of springtime.